As the best football teams, Barcelona Guide Bureau also renews uniform this season. It will be much easier to identify us. 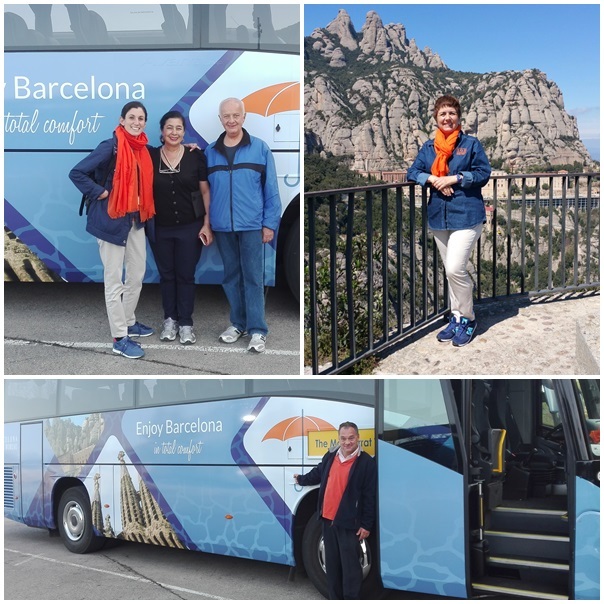 Jean shirt and beige pants and a fleet of coaches decorated with the most representative monuments and views you will find in our tours. Follow the orange umbrella and shirt on your travels around Barcelona and discover what this city can offer you thanks to our expert local guides. Enjoy your trip in total comfort! Our bus is totally new, both from the outside and the inside: roomy, air conditioned and with big windows – great to enjoy the fabulous views. The bus has a low emissions engine with the aim to reduce air pollution in Barcelona and CO2 climate change emissions – it is part of our Biosphere Responsible Tourism Certificate.